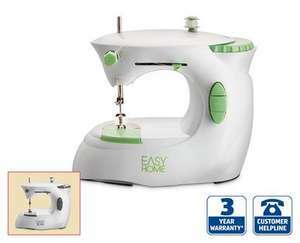 Mini sewing machine at Aldi from this Sunday (11th October), seems a good deal. Only useful for basic tasks but that's all I need it for. Great for beginners, basic sewing or craft jobs. Is this a stitch up? I'm told it's really difficult to get the thread tension set correctly, and that could be the cause why the needle keeps jamming and/or thread keeps snapping ... or maybe the thing is just too cheap and flexible? Good enough for correcting trouser lengths? Possibly, if you can get it to work. Of the 3 confirmed owners here, it looks like a 100% failure so far. If it's anything heavy like denim, that would be a definite no even if you can get the machine to work.. I bought my daughter one for Christmas. I would honestly say don't bother. I have had lots of power tools from Aldi which have been good quality and lasted years, but this is a poorly made rip off of the ones John Lewis sell for £50. As others have posted, it is near impossible to set this machine up correctly. I have a full size machine so I am used to threading, thread tension etc., but this is so poorly made it is very difficult to get these right. The machine constantly jams, thread breaks, it snags and pulls the fabric. I would have taken it back but had misplaced the receipt. I know you might think, 'It's worth a go for £13', but I wouldn't even have paid that for it if I'd realised how poor it was. It hasn't put me off Aldi power tools, but it has definitely put me off their other electrical stuff. Deal posting newbie! This is Avaristv first deal post. Help out by leaving a posting tip or just to show your appreciation for their contribution.